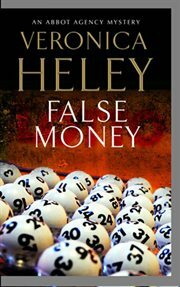 The item False money : an Abbot Agency mystery, Veronica Heley represents a specific, individual, material embodiment of a distinct intellectual or artistic creation found in Evansville Vanderburgh Public Library. The latest 'Abbot Agency' mystery - Bea Abbot runs a domestic agency that does not 'do' murder. But the disappearance of Tomi, the star of an award-winning short film, is a different matter, especially when charming but feckless Chris bribes Bea to investigate with a bouquet of flowers. When Bea - working through personal problems - discovers that Tomi is not the only one amongst his friends to vanish, however, she wonders if her own life might be in danger too . .